PLANET VC-203Px PoE over Coaxial Extender series is designed to extend IP Ethernet transmission and inject power over an existing coaxial cable for distance up to 1000m (3280ft) to PoE IP camera, PoE wireless AP and any 802.3af/at complied powered device (PD). It is a perfect solution for sending IP Video links and power to remote PoE IP camera installation that is beyond the 100 meters distance limit of Ethernet. 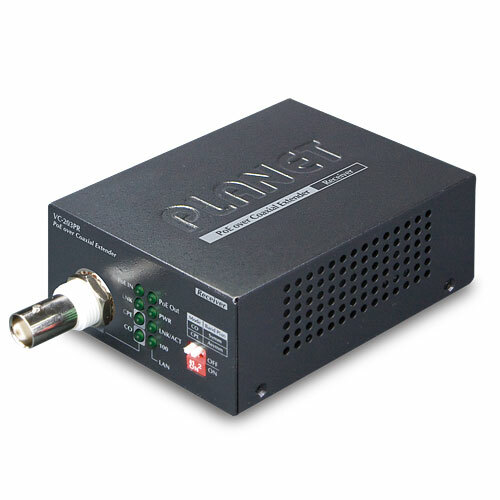 Based on IEEE 802.3at High Power over Ethernet and up to 25 watts of power output, PLANET PoE over coaxial extender solution eliminates the need for additional remote site power while allowing a single PoE source, such as a PoE network switch, to provide power to both transceivers and the camera at long range. This feature eliminates the need for local and remote site power supplies. The VC-203PR is a Single-Port, 802.3at High Power over Ethernet Injector providing maximum up to 30 watts of power output over Ethernet cable which allows data and power to transmit simultaneously through the cable to PoE PD (Powered Device). In addition, the VC-203PR also features PoE splitter function with selectable 12V/24V DC power output which makes non-PoE equipment power up as well. The VC-203PT and VC-203PR extender is the perfect solution for extended distance data and power transmission for warehouses, parking lots, campuses, casinos, and many more. They can operate stably under temperature range from -40 to 75 degrees C which enables the users to conveniently apply the device in almost any location of the network. The VC-203PT, which functions with the VC-203PR, can split into several kinds of combinations. The VC-203PT can power by either from external DC power adapter or high power PoE switch. The power output of the VC-203PR is selectable – PoE output to the PoE Power Devices (PD) OR DC power output to the non-PoE devices. DC Power Output 12V DC, 2A max. *The actual data rate and power output will vary on the quality of the copper wire and environment factors. **Default Downstream VC-203PR to VC-203PT ; Upstream VC-203PT to VC-203PR.